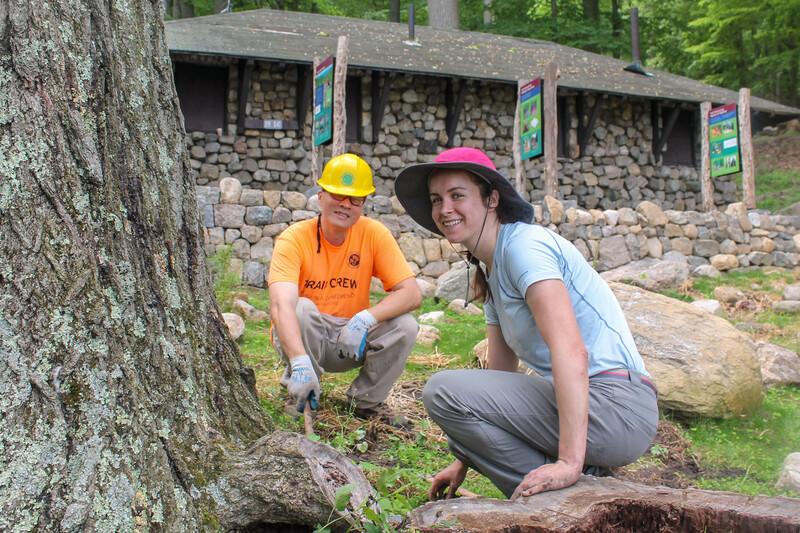 Outside or inside, close to home or at your go-to weekend trail destination, we aim to connect you with the volunteer opportunity that is right for you. Tell us how you'd like to be involved! 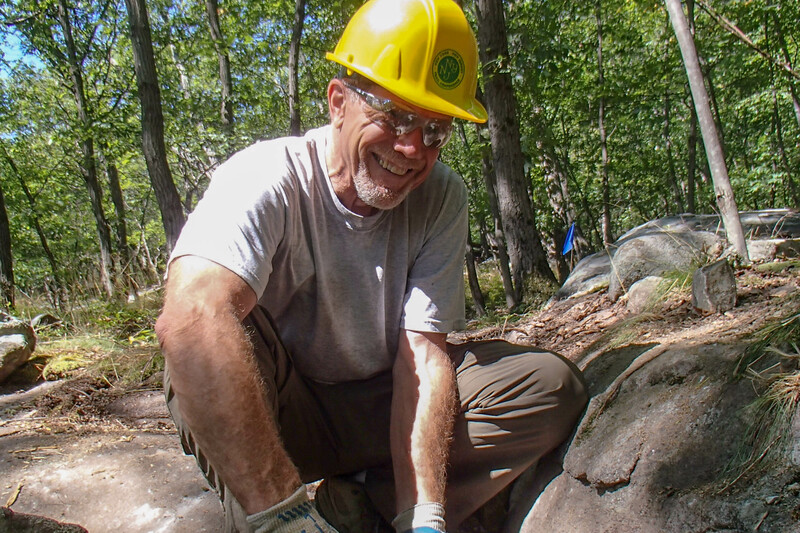 Grab your work gloves and spend a few hours or a whole day with a crew helping to make a difference in our parks. Or, we can match your group to the right project. We teach stewardship skills to outdoor-loving people. Our classes range from intro level in basic trail maintenance and invasive species identification to advanced training in trail layout and design, rock work, and more. Want to help restore the natural balance in our ecosystems? Do you value the habitat and welfare of wildlife? Join the team of volunteers who identify and record locations of “problem plants” in our parks. Looking for group volunteer adventures across our regions that are convenient for your schedule? Become a part of the Trail Conference family and adopt a trail of your very own! Help protect the historic Darlington Schoolhouse. We are seeking a volunteer with an interest in historic preservation. The Trail Conference wants help developing a long-term post-construction maintenance plan for the Darlington Schoolhouse buildings and grounds. 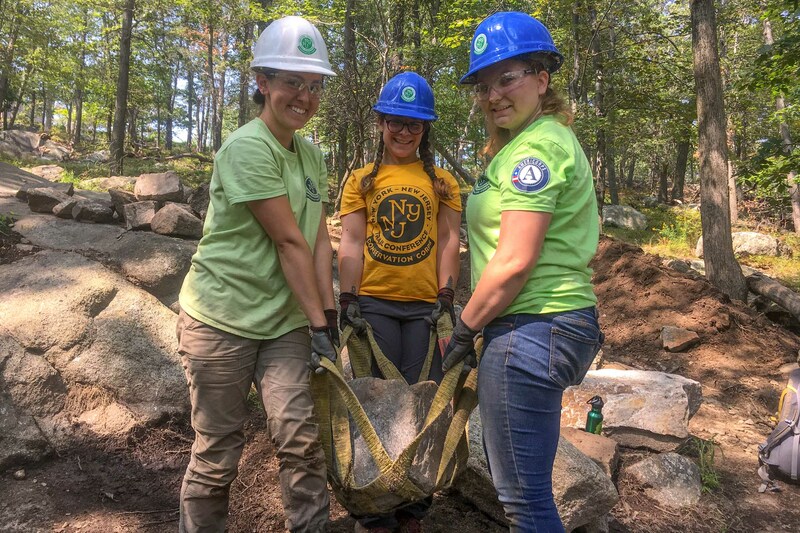 Trail Stewards are essential in helping discourage and mitigate misuse of the trails and the surrounding lands of popular hiking destinations such as the stunning Gertrude's Nose in Minnewaska, Harriman's Bear Mountain and Slide Mountain in the Catskills. Join the Trail Conference as a volunteer Trail Steward and inspire everyone who enjoys these trails to have a role to play in caring for them. 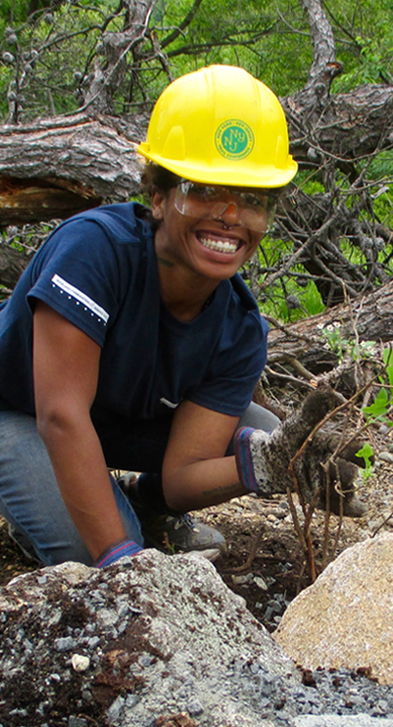 Join one of our Trail Crews for a day or a full season restoring and building sustainable trails for all! Help research grant opportunities for the Trail Conferences! You can support the Trail Conference by identifying corporations and foundations with missions and values that align with the Trail Conference programs. Be part of the team that makes this happen! Help educate the public about the Trail Conference and our trails through our maps and books! You can support both the Trail Conference and local businesses by placing our products in their stores. Be part of the team that makes this happen! Have a knack for planning events and love hiking? A spot on the Trail Conference’s Event Committee is the place for you! Be the greeting face of your favorite organization! Have a passion for the Appalachian Trail? Become a monitor of the trail boundaries that surround this historic, beloved trail. Come help us care for the native plant landscape at the Trail Conference headquarters! Sign up here. Whether you're an experienced maintainer or new on the trails, join us in ensuring that the trails stay clear and passable for the enjoyment of all trail lovers! Come help us remove invasive plants from this beautiful park! Ever wonder what the signs of a heart attack are? Ever wonder what to do if someone is choking? How to stop bleeding? How to administer CPR. Class is mostly geared to our chainsaw group, and is a requirement for the chainsaw certification card. Ever wonder how the trails stay open and passable? Where do those colored marks on the trees come from? Join us this Earth Day Weekend and find out! Ever wonder how the trails stay open and passable? Where do those colored marks on the trees come from? Take this workshop to find out! Whether you're a seasoned runner or new to the trails, learn the basics, hone your skills, and enjoy the freedom of trail running with the Trail Conference and our friends at Salomon. Join us for a jam-packed info session on Breakneck Ridge, the iconic hiking destination just north of NYC. Join expert trailbuilders in this work day to plan and lay out a future trailbuilding project. The Trail Conference is supported by more than 1,700 volunteers who annually donate over 93,000 hours of time to keep trails open, safe, and enjoyable for the public. There's trail out there that needs you! Volunteers who "adopt" a trail do the on-the-ground work to ensure it remains open and safe for fellow users. We're a community of volunteers who build and maintain hiking trails. Grab your workgloves and spent a day on a trail crew. Or, we can match your group to the right trail project. We build trails and teach on-trails skill to our volunteers. Our classes range from Intro level in basic trail maintenance to advanced training in trail layout & design, rock work, and more. Workshops are usually held in the field on real trail projects. Can my friends and I volunteer together? Yes! Adventure seekers who aren’t afraid to get dirty can share their love of trails by giving back either as an individual or a group. Our trail crews, Trail Love Days, and special trail projects are great for a group of friends or a corporate outing. Email [email protected] for details. What is the minimum volunteer age to volunteer? There is no minimum volunteer age to volunteer with the Trail Conference, however not all volunteer opportunities are appropriate for younger children. All volunteers under 18 must be accompanied by a signed parental permission slip or a parent. We obey the two-adult rule: adult leaders must have prior background checks and that no child is ever with only one adult. Because of this rule, some work trips may not be able to accommodate youth volunteers. Can I help out for a day? Yes! Take a look at our Find a Volunteer Opportunity map to see which trails we’re improving on which dates and how you can help. Do I have to get dirty and sweaty to volunteer? Nope. If you don’t want to volunteer outside, the Trail Conference has many important and meaningful opportunities that can be done from our headquarters at the Darlington Schoolhouse or even from your own home. Our trail crews and event leaders will provide you with everything you need for a great day on the trails—from gloves, hardhats, and eye protection, to shovels and pick mattocks. For those who want to adopt a trail to protect it for others to enjoy, you will be responsible for purchasing a few small hand tools to get the job done right. Do I need to be a member to volunteer? Membership dues helps support our ability to keep trails and trail lands protected. Without support from trail users, we would not be able to do all of the great work that our trails need. While membership is not required for many of our volunteer opportunities, it is greatly appreciated. Please see Become a Member for details. Do you offer training or workshops? To ensure that you have an amazing volunteer experience, we offer both formal workshops that include classroom and field components, as well as “on the job training” opportunities. Our award-winning Trail University courses, taught by our awesome trail professionals and volunteers, will give you all the skills you need to help improve trails. Do you have projects suitable for Scout groups? The Trail Conference encourages youth to participate on trail projects and we often work with Scout groups. It is the scout’s responsibility to identify and perform the preliminary planning for a project. To help offset some of the costs, the Elizabeth Levers Memorial Grant is available to support youth projects on trails maintained by the Trail Conference. The best way to start is to contact the Regional Program Coordinator for your area. See About Us for staff directory. What does being a trail maintainer involve? Trail Maintainers adopt one or more sections of a trail checking periodically, clearing debris, checking blazes, and generally ensuring that the sections are accessible.